Drawing the figure is one of the most intimidating challenges for aspiring artists, but it doesn't have to be! Over years of working as a fashion illustrator, Jane Davenport devised her own methods for deciphering in-proportion figures. She shares them in I [Heart] Drawing: Fabulous Figures, the first in an exciting new series. The core technique involves using equal-size hearts to build the structure of the figure. It's an easy-to- remember, highly customizable approach. The concept started life as an online workshop, and the results students have achieved have been astounding. 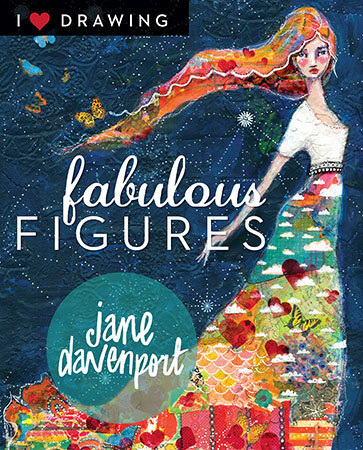 Jane has seen students go from "I can't draw a stick figure" to being able to create gorgeous, well-proportioned illustrations. After laying out the basics of drawing the figure, I [Heart] Drawing: Fabulous Figures walks readers through drawing and painting with different mediums; drawing the head and face, clothing, hair, and other features; and creating figures inspired by fashion illustration, fantasy, life drawing, and more.